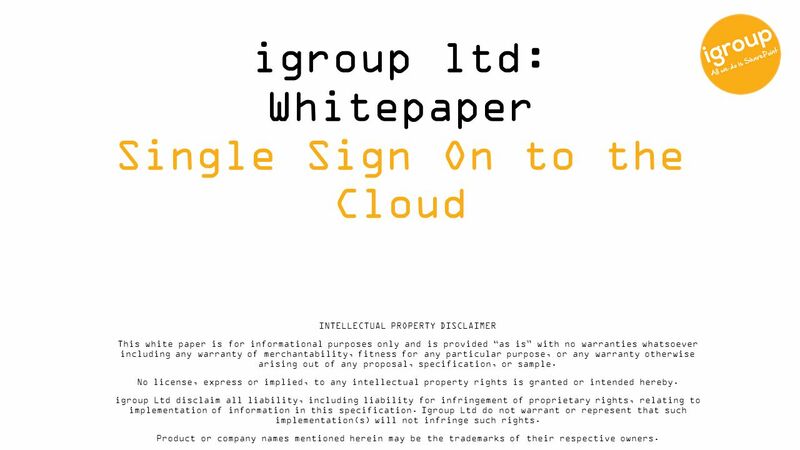 Igroup ltd: Whitepaper Single Sign On to the Cloud INTELLECTUAL PROPERTY DISCLAIMER This white paper is for informational purposes only and is provided. 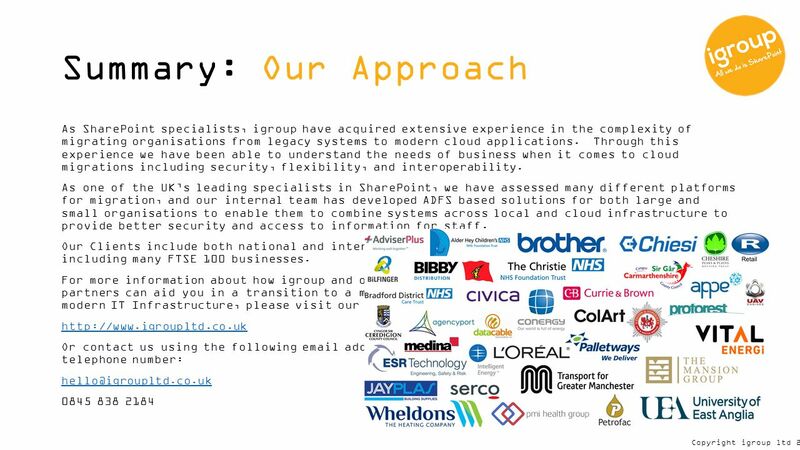 1 igroup ltd: Whitepaper Single Sign On to the Cloud INTELLECTUAL PROPERTY DISCLAIMER This white paper is for informational purposes only and is provided “as is” with no warranties whatsoever including any warranty of merchantability, fitness for any particular purpose, or any warranty otherwise arising out of any proposal, specification, or sample. No license, express or implied, to any intellectual property rights is granted or intended hereby. igroup Ltd disclaim all liability, including liability for infringement of proprietary rights, relating to implementation of information in this specification. 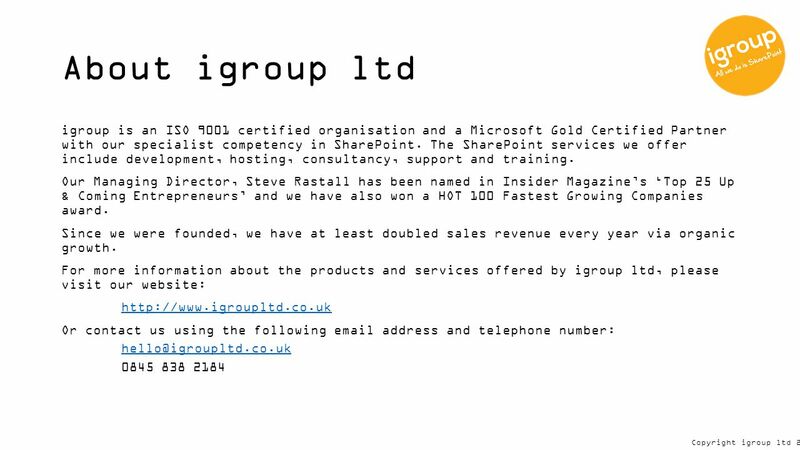 Igroup Ltd do not warrant or represent that such implementation(s) will not infringe such rights. Product or company names mentioned herein may be the trademarks of their respective owners. 8 Copyright igroup ltd 2015 Active Directo ry App ADFS 1 4 2 3 5 6 Option 3: Federation (ADFS) Federation is the preferred solution and provides true single sign on for users across local and cloud applications. This provides a seamless experience for users and properly allows for data to be attributed to an individual and shared across multiple applications. Federation uses the following process: 1: User provides sign-in information. 2: App provides log in details to Active Directory via ADFS. 3: ADFS provides token enabling user to access information. 4: App provides requested data to user & token for re- use. 5: User able to access application (within pre-set time limit). 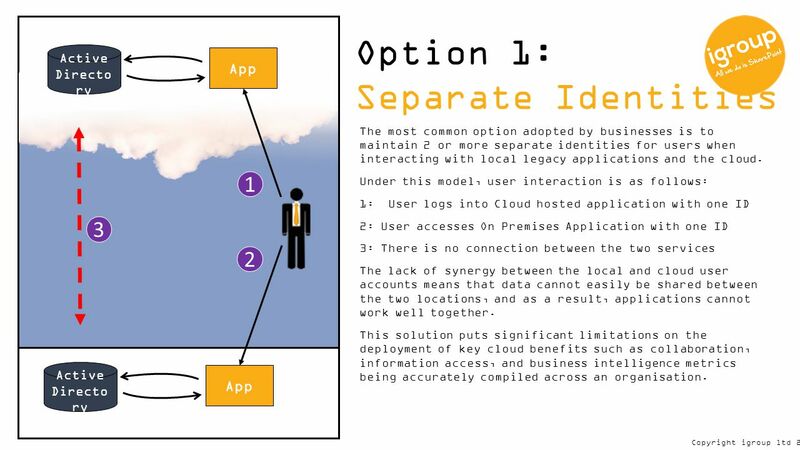 6: Local Applications accessed using same data store. 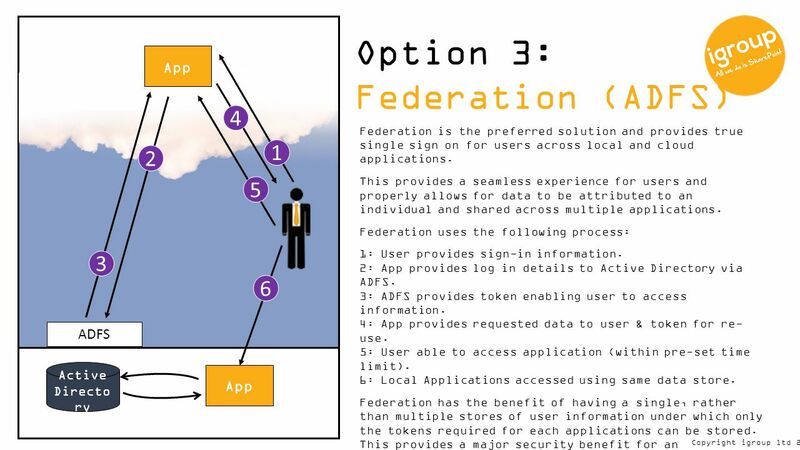 Federation has the benefit of having a single, rather than multiple stores of user information under which only the tokens required for each applications can be stored. 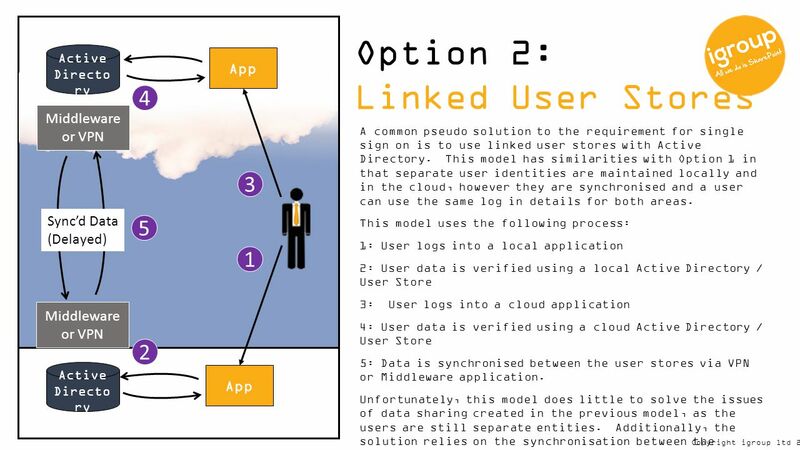 This provides a major security benefit for an organisation as only one copy of a user exists and permissions can be granted in a single location. This also provides a seamless user experience under which information can be accessed and shared across different applications simply. 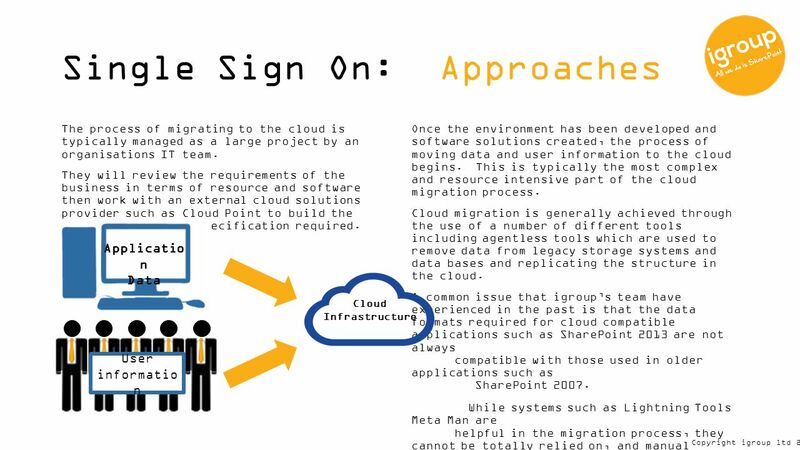 Download ppt "Igroup ltd: Whitepaper Single Sign On to the Cloud INTELLECTUAL PROPERTY DISCLAIMER This white paper is for informational purposes only and is provided." © University of Reading Go to View > Master > Slide Master to put your unit name here 20 April 2014 IT Services Identity Management. A l a d d i n. c o m eToken NG-OTP Combined PKI - OTP Authentication Solution November, 2008. Topics Changes Risk Assessments Cloud Data Security / Data Protection Licenses, Copies, Instances Limits of Liability and Indemnification Requests for. 1 ILANTUS Proprietary Jaunary 20, 2014 Enabling complete AGS features on ISIM Compliance Express – ISIM Integration. Microsoft ® Exchange Online Migration and Coexistence Name Title Microsoft Corporation. | SharePoint Online as an Enterprise, Collaboration Platform Greater Idaho SharePoint Users Group September 25, 2013 Pete. Study conducted on behalf of Microsoft by Harris Interactive Inc. Study conducted on behalf of Microsoft by Harris Interactive, Inc. Study conducted on. Damian Leibaschoff Support Escalation Engineer Microsoft Becky Ochs Program Manager Microsoft. 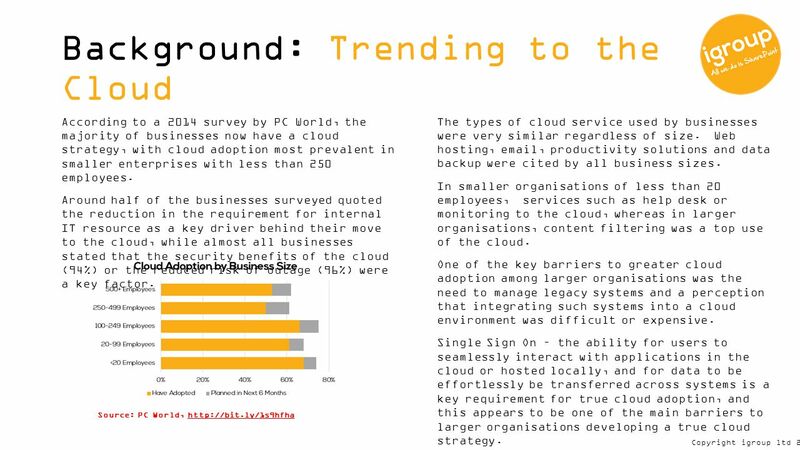 70-293: MCSE Guide to Planning a Microsoft Windows Server 2003 Network, Enhanced Chapter 7: Planning a DNS Strategy. 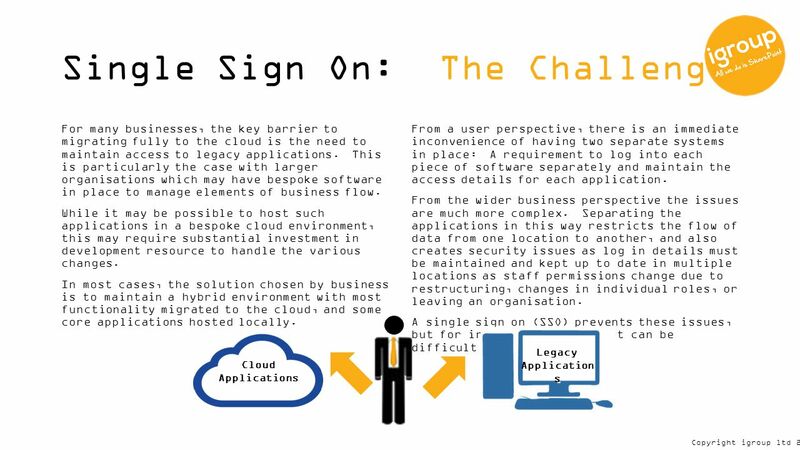 1 sm Using E-Business Solutions to Meet Management Challenges: Interoperability & Flexibility Bring Success to the Implementation of Specialized Components. Product Manager, Windows Client Robert Geller. Need to differentiate from competitors Customer complexity driving cost Need new growth strategies Difficult.